Folk artist and storyteller Matt Butler performed at the Camden County Correctional facility, Thursday, March 15, 2018. 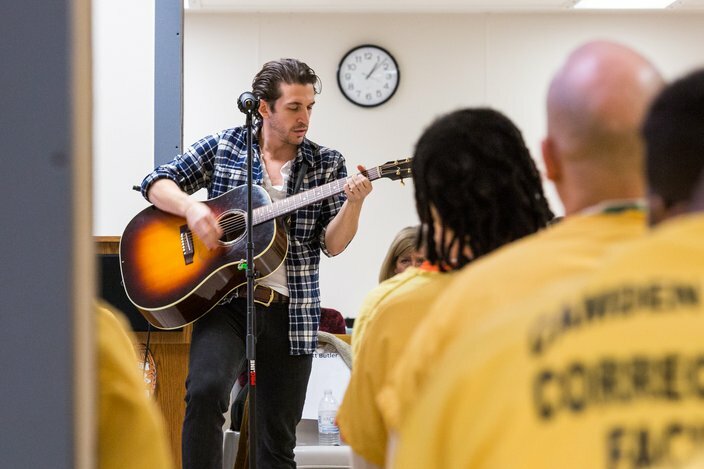 Prison felt a little less like the clink on Thursday when an aspiring artist brought his soft melodies to inmates in Camden for a live concert. 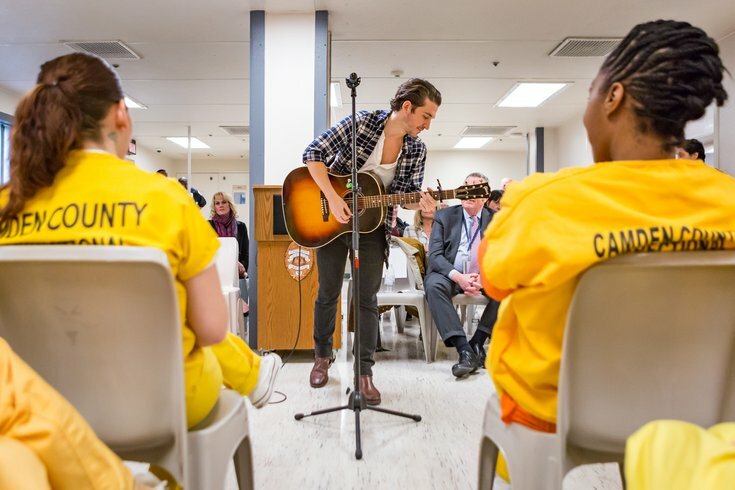 Matt Butler, a New York musician and recovering drug and alcohol addict, performed a series of folk and rock songs while weaving in his stories of climbing back from his own addiction for more than two hours Thursday at Camden County Correctional Facility. Johnny Cash-style, he played his guitar for the inmates – many facing the same issues – and sang about addiction, pain, family, heartache and most importantly – hope and reconciliation. Butler first gained notoriety as the lead singer of the New York-based band Reckless Sons, but lost his way when he fell into alcoholism and substance abuse. “One of the real, truest miracles to me about recovery was when I got to this point where I was in such intense conflict. I was these two versions of Matt. I was this guy that I wanted to be – the son, the bother that I wanted to be, the guy that was accountable, friendly, responsible, honest, not full of s**t, not lying about everything, and then there was the version of who I was. I was in a lot of pain as a result of that,” he said into a microphone. Dubbed “Concert Behind the Walls,” the performance was intended to bring the message of recovery. Butler sang for about 60 inmates, both men and women. Rebecca DeSante of Delanco, N.J., is in jail for violating her probation after a previous charge of possession of narcotics with intent to distribute. She spoke with PhillyVoice about her reactions to the concert, having only learned Butler was coming hours prior. DeSante is scheduled for release on April 21. DeSante’s cellmate, Gina Merritt, from Lindenwold, N.J., is also jailed for possession with intent to distribute. With 36 weeks left on her sentence, she’s slated to be paroled to a halfway house after she leaves CCCF. Merritt said Butler’s visit was a welcome break-up to an otherwise monotonous day-to-day schedule behind bars. “It makes your day go by faster and doesn’t seem so much like jail. You’re not in your head as much, so it helps,” she said. 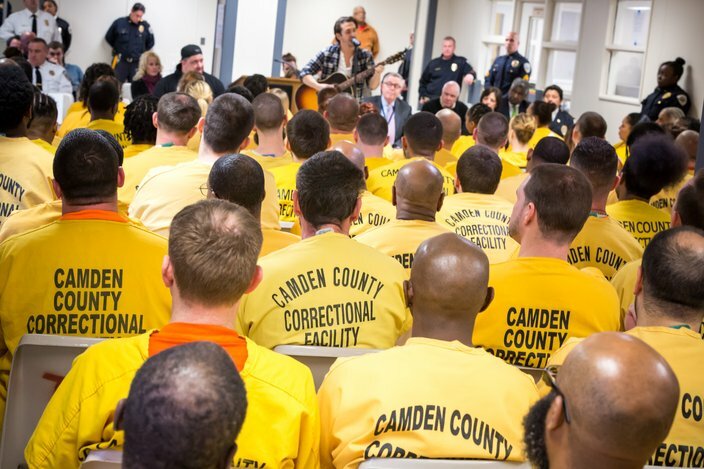 Dozens of inmates at the Camden County Correctional Facility attended the 'Concert Behind the Walls' event, Thursday, March 15, 2018. Butler was candid with his storytelling, explaining how, throughout his struggle, he was kicked out of his mother’s house repeatedly and would often come home to a locked door. “When my eyes were finally open, and they said the key for you to stay sober – one day at a time – is for you to be rigorously honest,” he said. Butler tours correctional facilities around the country as a way to help make a positive difference to the people of those communities. It was shortly after this time, Butler said, that he decided to perform at jails and prisons across the country. Camden County Freeholder Susan Shin Angulo said the day's event came together because Butler attended a vigil dedicated to local individuals who had lost loved ones to drug and alcohol addiction. "We were paying respects to people who are recovering or people who have died from overdoses, and he performed and it was amazing,” she said.